Thirteen persons from Kayō village in Kushi district and twelve persons from Abe village, riding on two ships of six sails each, arrived at the harbor entrance of Yonabaru. They had previously been on official business on behalf of the royal government. At the time of their return [from official business] they met strong winds and shipwrecked on the ocean surface at Ikei village in Yonaha district. From that village, the eight persons Shimabuku Chikudun, Miyagi Chikudun, Miyazato Chikudun, Uchima Niya, Buta Uchima, Taru Kanegusuku, Masa Shinzato, and Ushi Higa – and besides these twelve more persons from the same district – saw what happened and set out with eight small boats to come to the aid and rescue the persons. They returned to the seashore in front of Sokei village in Kin district and went ashore. They changed clothes of the shipwrecked persons, made fire, cooked soup to drink and porridge to eat and brought them back to life. Then they sent them back to their original place of origin. On account of the above events, the various officials of the district submitted a written report to the royal court. On top of that, Shimabuku Chikudun and others already saved human lifes in both the years 1797 and 1799: once when an emergency of a ship within the Torishima traffic took place, and once when a Māransen was destroyed at Tomari village. Coming today, since they provided distinguished service for a third time, all were bestowed court rank. 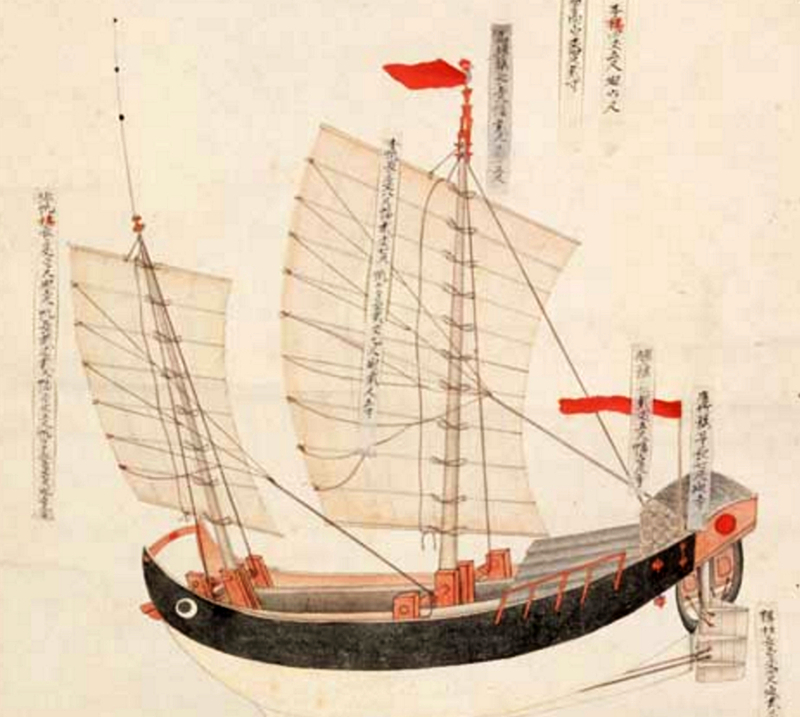 Note: Māransen 馬艦船 were the most popular Chinese-style junks used for inner-Okinawan traffic during the latter early modern period. This type of junk was imported from Chinese Fujian province around first half of the 18th century. It is a smaller sized ship and also known as Yanbarusen 山原船. 19th century scroll showing a Māransen (Yanbarusen) of Okinawa. From: Tokyo National Museum.